Context has the potential to enhance Web services in mobileenvironments to a great extend. Yet, challenges such as bandwidth restric-tion or dynamic changes require considerations that need to be reflectedin the distribution of context. Within the VIMOCOS project, we present a novel technique to share and control access to context. In structuring context information according to levels of granularity, we achieve context propagation at the relevant levels of detail while protecting the privacy of the user. 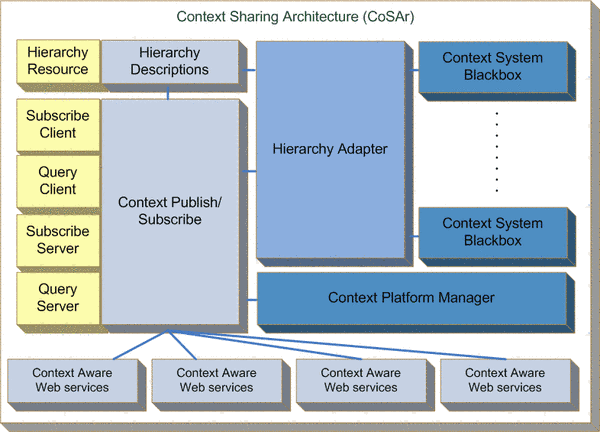 Introducing the Context Access control, Subscription and Query Language (CASQL), we enable fine-grained subscriptions and control over context in our proposed Context Sharing Architecture (CoSAr). The hybrid approach of query and subscription to context information reduces protocol overhead as opposed to pure pull or pure push-based solutions. Subscriptions based on levels and values reduce the amount of unnecessary (because too detailed) context information. Specifying which part of a hierarchy to transfer upon a request or notification further limits the transferred amount of context. The current prototype is implemented using the Knopflerfish OSGi Container. Subscriptions to context information is enabled through WS-Notification.